"You have put more joy and rejoicing in my heart than [they know] when their wheat and new wine have yielded abundantly. Here King David is thanking God that the joy He gives us far surpasses that which worldly people experience even when they prosper materially and indulge in drink. He knows that no matter our situation, our safety comes only from the Lord. This allows those who are in right standing with Almighty God have sweet and untroubled sleep because it's God Himself who keeps us safe and gives us confident trust in Him. 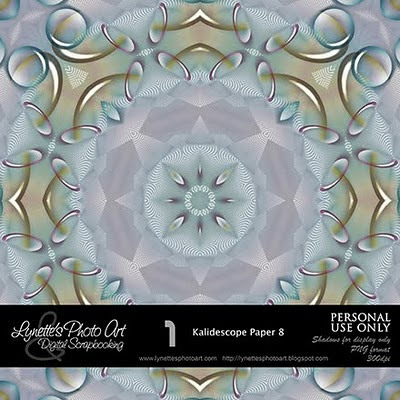 Here's the last in our pretty kaleidoscope paper collection for a while. Aren't they fun? Tomorrow I'll start giving you a great collection of pattern overlays I've made. They make great papers! This is a beautiful page! Love the colors, as well as the password! Super idea! God Bless you! Thank you for another great page.